Deeba’s friend Zanna is the Shwazzy, the chosen one, prophesied to save the fantastic hidden alternate city of UnLunDun from the evil sentient Smog that threatens to devour it. But what happens if the chosen one fails? Fails before the book is even half over? What happens to a city filled with objects declared obsolete in London, forgotten by the real world, and transformed into living things in UnLunDun? Deeba may not be the Shwazzy, but she can’t let the Smog win. High adventure, double-crosses, magical creatures, and completely unexpected plot twists–this book could not be better! If you like exciting stories full of original creatures that you’ve never seen before, this book is for you. If you like stories with animals that talk and think like people you will like this story a lot. It is like the Ugly Duckling fairy tale but it is set in Tasmania near Australia and so the animals are very different. Ugly is hatched to a Pacific black duck. His mother loves him very much and tells him that he is a genius. However, it soon becomes clear that he is different and the other ducks on the pond try to kill him. His mother and her brood are constantly running from the other ducks. Finally his mother tells him that he will have to go away because she cannot protect him. He reluctantly goes away but always remembers his mother and everything she told him about the world. A wallaby helps him escape the mean ducks and a wombat gives him a home. He has some very interesting interactions with the animals and people in Tasmania. He learns a lot about the animals and makes many friends. Can you guess the ending? It has a very nice twist to it. This is recommended for readers in 4th and 5th grades. Have you ever been to Alcatraz Island? It was an infamous federal prison and is now a famous tourist destination run by the National Park Service. Whether you have been there or not you can probably imagine how scary it would be to be a high school boy hiding from a teenage gang in the dark old prison and its grounds. Danny Sullivan found himself in just that situation, even to the point of being locked in a cell by the gang, and was afraid he would continue the tradition of no prisoner ever escaping alive from Alcatraz. His suspenseful adventure will keep you reading. Everyone who’s ever seen or heard the Nutcracker knows about the evil Rat King. But there could never be such a creature in real life. Or could there? As it turns out, a “rat king” is a naturally occurring phenomenon that sometimes happens when rats are babies. If you’re squeamish, stop reading here and go to the next paragraph. It seems that the young rat’s tails can get tangled in the nest. The harder they try to pull them apart, they tighter the knots get. Eventually, the tails get “sealed” together permanently by dirt and droppings making what was once just a crowd of baby rats into a giant multi-headed monster that cannot function without help from other family members. Gross, but cool. The red side bars detail fun stuff like how even the White House has rats. President Kennedy once clobbered one with a shoe. Also, did you know that though they have been known to spread disease, most rats a fastidiously clean? And, if you like to travel, be aware that in some countries you may find rat on the menu. But, I’m getting ahead of myself, if you want to learn more, as I’m sure you will, find a comfy spot, put your feet up and read Oh, Rats. Just make sure there’s no cheese around…or you might have company. Imagine listening to music on the radio when suddenly there is an announcement, “Ladies and gentlemen, we interrupt our program to bring you a special bulletin . . . there’s a report that several explosions have been observed on the planet Mars. Well, that is exactly what happened during the evening radio broadcast on October 30, 1938. As the evening went on, the announcer gave updated reports of further scary events until the gravest announcement of all: Martians had landed in the farmlands of New Jersey. People across the country panicked. Was there really a Martian invasion or was this radio show merely a hoax? This event really happened the night before Halloween back in 1938. Some of your relatives may remember the hysteria caused by that radio broadcast. 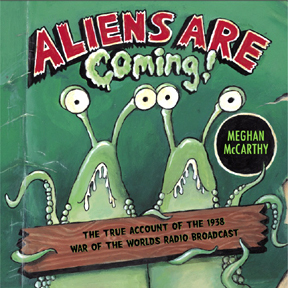 If you would like to read a short, simple retelling of the 1938 War of the Worlds radio broadcast, I suggest that you might enjoy this book – I did! Another great story for spring with themes of friendship and sharing is Duck and Goose by Tad Hills. In this title a duck and goose find a colorful ball which they believe is an egg. Both believe they are the rightful owners. After scrambling to be the first to the top, they find themselves sitting together. While they argue at first, they soon find themselves thinking about what they can do together with “the egg”. A little bird helps them see their silliness, and they have fun playing with the ball instead. The story has a clever ending and adorable illustrations. This is another terrific story about funny, feathered friends. I just finished reading (actually listening to) this book, and I loved it! It was recommended to me since the story is set in a small town funeral home, and my own mom grew up living in a funeral home. The story revolves around 10-year old Comfort Snowberger and her family, her extended family, and her dog Dismay, and their lives running a funeral home. You may think this would make for a sad story, but just the opposite – through Comfort’s eyes, we see death and life as a celebration. The story includes valuable information from Comfort, including “Top Ten Tips for First-rate Funeral Behavior”. Although her dear Great Aunt Florentine does die in the story, there is much more that just funerals that occur, including a life-threatening flood, a pesky cousin who is to be avoided at all costs, and a friendship gone bad. Despite the somewhat unusual setting, I think girls will still see themselves in this story. This is a wonderful girl/family/animal/friendship story and don’t forget coming of age too! A good read!